When a retired theater manager named Abraham Stoker expired in England at age 64, after a series of strokes, the international news reports that he was dead and gone weren't entirely accurate. Stoker was dead, certainly, but not gone. Or rather gone, but not Dead. For Bram Stoker had already staked (if you will) his claim to immortality, creating a deathless count from the Carpathian Mountains in an 1897 novel called The Un-Dead, a title that was changed on the eve of publication to Dracula. And though Bram Stoker, through Count Dracula, never really died, he was emphatically declared dead at number 26 St. George's Square, London, on April 20, 1912, the curtain ringing down on one celebrated existence just as it was rising on another. For that debut, we have to cross the Atlantic—not an easy task on April 20, 1912, as passengers steaming for New York City aboard the SS Bremen would attest. In the frigid waters that day they reported "many piteous sights," including three lifeless figures clinging to a single steamer chair; empty life rings afloat in the water; and the stiffened body of a woman in a nightdress, baby still clasped to her breast. All had been passengers on the RMS Titanic, which struck an iceberg six days earlier en route to New York. If not for that tragedy, the Titanic would have launched its return voyage to England that very day—at noon on April 20, 1912—an exceedingly inauspicious date to be setting out on a long journey. Congrats on your win, but in the name of Bobby Jones, how about some love for the loser? In drafting wide receivers, Calvin Johnson—towering, muscular and superbly athletic—is the new model. But where are the corners who can neutralize such a weapon? The only baseball player to embark on a major league career that day—the unfortunate Benny Kauff, who debuted for the New York Highlanders—would be banned from the game for life in 1921 by commissioner Kenesaw Mountain Landis, for alleged ties to an auto-theft ring. Kauff would never be reinstated to the game, despite his unambiguous acquittal in a court of law. Two ballparks were born on April 20, 1912, with very different life expectancies. Tiger Stadium opened in Detroit, initially named Navin Field, and would survive into a beautiful blue-rinsed old age, finally passing after 87 years in a kind of crumbling grandeur. The other park born that day, would not, it appeared, be so lucky. Malevolent forces were trying to do away with the fledgling Fenway Park in Boston as early as October 1918, only six years after it opened. America was gripped by a new austerity following its entry into World War I when the owner of the Red Sox, Harry Frazee, joined manager Ed Barrow in inspecting Braves Field only weeks after the Sox had won the 1918 World Series. Frazee was considering sharing that park with the National League's Boston Braves. Maintaining two ballparks in Boston for limited summertime use seemed "out of harmony with the systems of efficiency in vogue at present," as The Boston Daily Globe put it that Halloween, an apposite date for this horror-born ballpark near Kenmore Square. In the end Frazee did nothing quite so karma-fraught as abandoning Fenway, and made do instead with selling Babe Ruth to the Yankees. When the Great War could not kill Fenway, Mother Nature took a stab. Three separate fires in 1926 consumed the wooden bleachers that ran along Fenway's leftfield line. The park would be rebuilt—and refurbished, and reconfigured, for the rest of the 20th century—but by the end of the millennium, when Tiger Stadium closed in 1999, Fenway Park was finally declared unfixable. "It would be easier to straighten the Leaning Tower of Pisa," Red Sox owner John Harrington said that season, when the park hosted its valedictory All-Star Game, which in turn hosted Fenway's greatest star, Ted Williams, who later would himself prove remarkably resistant to conventional modes of death. Thirteen years later, the Leaning Tower still leans in Pisa, and Fenway Park in Boston remains upright, flourishing at 100, impossible to kill by fire, by old age or even by its own hand. As ballparks go, it is The Un-Dead, though devotion to it has seldom been undying. By the time Tom Yawkey purchased the Red Sox, for $1.5 million in 1933, the ballpark was already familiar with near-death experiences, and was sinking into a deep decrepitude at age 21. Yawkey set about rebuilding Fenway entirely that winter, but in the course of doing so, on Jan. 5, 1934, another fire spread from a building across the street and burned the ballpark for five hours. The new grandstand in leftfield was ravaged, as were the centerfield bleachers, requiring $575,000 in repairs and the construction of steel-and-concrete replacements. The park's walls were likewise fireproofed in tin and concrete, including the new leftfield wall, built to a height of 37 feet. Tom Yawkey had, albeit unwittingly, done what Bram Stoker did 37 years earlier: He had created a timeless monster. Only nobody called it that yet. The wall wouldn't be painted until 1947, giving birth to its nickname, the Green Monster, a mythological creature from some Gothic novel. 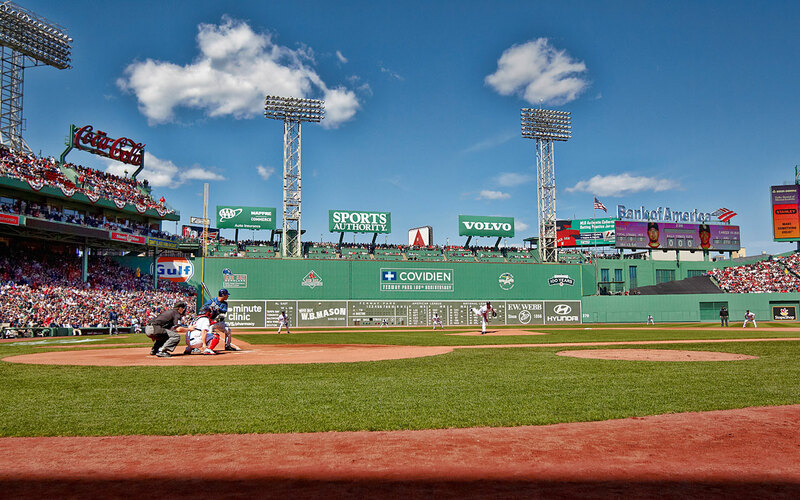 Every decade for the next half century, Fenway Park would be stalked by baying mobs—of real estate developers, government officials and even its own proprietors—bearing metaphorical torches and pitchforks, wanting to do away with the beast. That same year, 1947, seven light towers were installed, the first step in Fenway's becoming, like Stoker's count, a largely nocturnal creature, often unloved and forever under siege. And so what nature could not achieve with fire, man set out to do. The willful demolition of Fenway Park was being proposed since at least its early middle age. In 1958, when the Giants and the Dodgers left New York in part for want of parking near their urban ballparks, the president of the Metropolitan Coal Company in Boston proposed to build a domed "dream stadium, [an] ultra-modern sports palace" on Route 1 in Norwood, Mass. The financial backers of this privately funded Xanadu would move ahead only if the Red Sox agreed to serve as tenants in this stately pleasure dome. Had the dream come to pass, Ted Williams would have ended his career not in "a lyric little bandbox of a ballpark," as John Updike famously described Fenway in 1960, but beneath a synthetic sky, spectators ensconced in $5,000-a-year "delux boxes," in a suburban redoubt replete with a 100-tee driving range and "bowling alleys with glassed-in nurseries" for "pin-minded mothers." Think of Williams, in his final at bat, hitting a home run and refusing to do what the stadium could—which is to say, doff its cap. For this was to have been a retractable-roofed Red Sox park, to replace the obsolescent Fenway, which was 48 years old and with scant parking, and thus doomed in the automotive utopia of Eisenhower's America, with its carhops and drive-ins and nascent interstate highways. The Sox stayed, of course, but the dream of the dome would not die. In the 1960s—the decade in which America resolved to visit the moon—the Greater Boston Stadium Authority planned another dome, suitably space-aged, near South Station. That stadium and an adjacent arena would be home not just to the Sox but also the Patriots, Bruins and Celtics, ridding the city of blighted Fenway and the benighted parquet of Boston Garden with one progressive sweep of the wrecking ball. The new ballpark would resemble the other state-of-the-art stadia going up in St. Louis, Atlanta, Oakland and Washington, D.C., big, round symmetrical quadruplets, multipurpose and multi-parking-spaced, without Monsters or Pesky Poles or hand-operated scoreboards. In the absence of winning teams, these dream proposals were lovely to contemplate, and so such proclamations were issued—almost exactly—at 10-year intervals. In 1969 the club considered a $40 million proposal to expand Fenway to 50,000 seats by "knocking out the leftfield wall," vanquishing the Monster within the monster, killing the vampire by staking its heart. A decade later, in '79, the Sox made a veiled threat to Boston mayor Kevin White that the club would move to a multiuse stadium in suburban Wilmington. By the late 1980s, the Sox planned a $50 million "revitalization" of Fenway that included a five-deck parking garage. Fenway, built four years after the introduction of the Model T, never had a place to put the auto-mobile. More than an ancient joke, "Pahk the cah in Hahvad Yahd" was sound advice for anyone foolish enough to drive to Fenway Park. And so the Sox spent the final decade of the 20th century trying with renewed vigor to kill this ancient creature. There was the proposed "Megaplex," a sports-and-convention center on Northern Avenue. There were various plans to build a new park next to Fenway (and a new Pats stadium next to that) with parking for both suspended above the Massachusetts Turnpike. In 1995 two Cambridge architects proposed putting not the parking garage but the new ballpark itself above the Mass Pike, evidently on the grounds that if you couldn't drive to a Red Sox game, you could at least drive under one. The team had by then decided that renovating Fenway was inadequate. There would be no Band-Aids on Updike's bandbox. The team announced its intention in 1995 to have a new home by that futuristic year of 2001. Harrington told a state commission that Fenway would remain structurally sound only until '05 or so, but was already "economically obsolete," rendering the team unable to compete with his luxury-boxed brethren in the Bronx and elsewhere. And so a new stadium site was being pushed, in South Boston, to be developed by a Boston real estate magnate. That project died, like all those before it, in a thicket of politics, red tape and residential opposition, and the thwarted developer would go on to buy the Dodgers. Frank McCourt proceeded to plunge that franchise into bankruptcy, suggesting that Fenway had dodged a bullet, a silver bullet, as the ballpark was by now a horror-movie monster—apparently immortal but almost certain to die in the final reel. One thing was certain: The new Fenway Park—whatever it was, wherever it was—would not be called Fenway Park but something more remunerative. "If AT&T or New England Telephone want to pay $50 million and name the park after them," a Sox executive told the Globe in 1996, "tell 'em to come talk." The 1999 All-Star Game, then, seemed a farewell to Fenway. The latest $300 million park being proposed on 14 acres adjacent to the ballpark was to have the Green Monster transplanted into it and the brickwork facade transplanted onto it, creating a Frankenstein's monster of old and new. The stake was on the heart, and the mallet was being raised when, in December 2001, John Henry and Tom Werner bought the Red Sox and set about straightening the Leaning Tower of Pisa. They at once renovated the park and the team, neither of which had seen a world championship since the fall of 1918, when Frazee celebrated by making that first fumbling attempt to flee Fenway. You know the rest of the story: How the Sox, in 2004, with a ritual shedding of blood, finally won the World Series again based in a revamped—a revampired?—Fenway Park. The victory came as a great relief to countless fans, among them Stephen King, the most renowned horror novelist since Bram Stoker, to whom he is tied not just through genre but through Fenway, a monster every bit as unkillable as any other conjured by man.